As strong and permanent as concrete ponds can be, occasionally they develop leaks. These can be from settling, tree roots intruding or a blow. Repairing them is easy and it is not necessary to drain the pond. Finding the leak is the first step. Assuming the pond has held water properly before, look for a crack. Most cracks are vertical and fairly easy to see. If there is a layer of mossy algae on the concrete, a swipe with a wire brush should reveal it. Sometimes cracks are horizontal and harder to find. If the pond is losing water, the crack should be right at the low water mark. 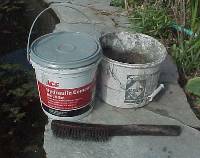 Hydraulic cement (sometimes called leak-stop or quick set) is available at hardware stores in small tubs and keeps indefinitely if kept dry and out of the sun. It sets VERY rapidly when mixed with water and, once mixed to proper consistency, can be applied UNDER water. A second tub or container is needed for mixing the cement. Prepare the area to be repaired by cleaning it thoroughly with a wire brush. Mix only a small amount of cement at a time, about a handful, as it sets in as little as 30 seconds. While kneading the cement ball with one hand, apply small amounts to the crack with the other, starting from the bottom. Smooth the edges before it sets. Work your way up the crack with more cement, repairing even above the water line. Speed of setting can be slowed by adding a small amount of conventional mortar mix to the hydraulic cement. Be cautious though since you want it to set in the water and not simply dissipate. The repair is immediate and nothing else is required. Water can be added and, if the pond continues to lose water, look for another crack.